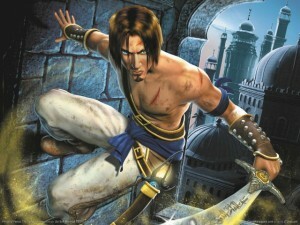 Always on the cutting edge this past week I played the 8 year old Prince of Persia: The Sands of Time game for PC. The updated graphics were a really nice touch, too bad they didn’t update anything else like the terrible camera controls. As much as I loved the platforming in the game, I hated the combat. I think it’s due mostly to the controls being relative to the camera and the camera being not fixed. So you’d be fighting and just about to do a move and the character would walk over a certain invisible line which makes the camera switch and you are suddenly facing the wrong direction. This happened a lot. And the frustration really spoiled the game to large extent. I have never yelled obscenities as loud and as often at any other game as I did for the Sands of Time, I have also never rage quit a game quite so often yet kept coming back to it. If it were any other game which didn’t have such glowing reviews, I would have trashed it like I did when the game originally came out at the first major fight with the Prince’s father (ostensibly the King of Persia). For the longest time I remember quitting the game at that point but couldn’t remember why, and after playing to that point I remembered fully. Sadly it wasn’t even the worst battle in the game, luckily the worst battle is basically the last one. The game is rife with camera angles that block out the prince or his attackers, bugs that get you stuck on the ground or constantly hit while trying to get up. It’s designed for a simpler time when frustrating your audience was expected. That’s how you used to make a game last. I read a lot about how The Sands of Time was a “quick” game, it took me at least 8 hours of game time, but Steam claims 13 hours and I don’t doubt that because I would try a fight for a while and then rage quit and come back later. This is actually the amount of time I want to spend with a game. On rare occasions I don’t mind spending 40 hours on a really great story like Mass Effect, but don’t waste my time with terrible stories that just have 40 hours of side quests and pointless things to do (I’m looking at you Oblivion). Certain puzzles reminded me of a simpler time too, there is actually a puzzle that requires trial and error to figure out with absolutely no clues to solve, just mindlessly trying one door after another until you make it through. This is the kind of thing that was popular back in the day, remember the Legend of Zelda’s Lost Woods? I will say the story was very good, and it progresses very well. I was actually surprised by it’s quality. That and the platforming kept me playing through the annoying combat and when I hit that final battle that was too frustrating I found a save online that got me past it. About halfway through I cut it some slack because it can’t really be fair to compare it to games that took the good parts and fixed the bad parts like God of War 3. I’m glad I finally finished it, and I’ll probably play Warrior Within or Two Thrones at some point (since I own them) but I think I need a break from them if the combat is as bad.